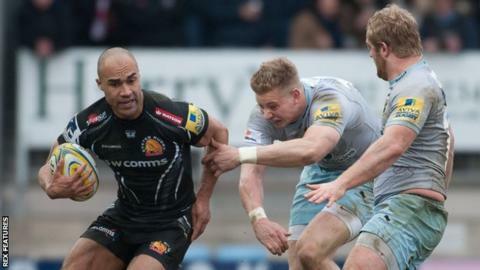 Exeter Chiefs scored 17 unanswered second-half points as they fought back with victory over in-form Northampton to move top of the Premiership. Saints arrived at Sandy Park on the back of five wins in six games and led 12-3 at the break thanks to tries from Lee Dickson and Ken Pisi. Olly Woodburn scored in the corner to cut Northampton's lead. And Gareth Steenson kicked four penalties, to add to a first-half effort, to seal victory for Exeter. Exeter, who have won four of their last five matches, have never finished in the top four but look well set for a play-off place and sit first after Saracens lost to Leicester later on Sunday. Rob Baxter's side were completely transformed after half-time as they dominated the breakdown and won 10 second-half penalties, with Saints failing to earn one. Saints finished last season as the league leaders but it has been a mixed campaign this time around following a poor start. Their pack struggled to impose themselves in the second half, although they thought they had nicked a losing bonus-point just before full-time but the Television Match Official ruled no try. Exeter assistant coach Ali Hepher: "We looked as though we weren't enjoying our rugby in the first half as we were frightened to make mistakes. "We had a quiet word at half-time and this freed us up. We created a different, positive mindset and we said that we needed to be positive and not afraid of errors. "We took on the message and turned the screw, we had a bit of self-belief." On replacing Thomas Waldrom: "We struggled at the breakdown, Thomas wasn't injured and Julian Salvi is one of the best in that area in the Premiership." Northampton director of rugby Jim Mallinder: "It's frustrating, we didn't get the bounce of the ball and a few refereeing decisions went against us. "I thought we scored a good try right at the end, which would have got us a bonus point, and the officials were wrong to disallow it. "I thought we were very good in the first half as we took our opportunities but our second-half performance was poor as we coughed up possession and kicked away too much ball. "The Six Nations period was a good one for us as we've won more than we've lost and hopefully we'll be able to integrate our international players back into our side." Exeter: Turner; Woodburn, Slade, Whitten, Short; Steenson, Lewis; Moon, Yeandle (capt. ), Williams, Atkins, Parling, Ewers, Armand, Waldrom. Replacements: Taione, Hepburn, Rimmer, Stevenson, Salvi, Chudley, Hill, Bodilly. Northampton: Foden; K Pisi, G Pisi, Mallinder, Tuala; Hanrahan, Dickson (capt. ); Waller, Haywood, Hill, Craig, Day, Harrison, Gibson, Fisher. Replacements: Marshall, Waller, Denman, Matfield, Wood, Fotuali'i, Myler, Wilson.